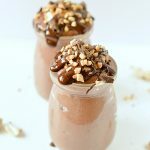 Ground chia seed pudding with Almond milk is a smooth chocolate peanut butter healthy dessert or breakfast. Easy, gluten free, vegan, low carb, keto and whole 30 ! Place the chia seed into a blender and blend for about 20 seconds to form ground chia seeds. Add all the rest of the ingredients - order doesn't matter. Blend again for 30 seconds-1 minute until all the ingredients comes together. If it stick to the side of the blender, you can stop the blender every 30 seconds, scrap down the side, and repeat until smooth. You can't over process it! Taste and adjust texture and sweetness. Add more almond milk, 1 tablespoon at a time for a runnier pudding. This may be useful if you replace the sugar free liquid sweetener by crystal sweetener (erythritol or monk fruit sugar). Transfer into ramekin or serving jar. Decorate with a dollop of fresh peanut butter, drizzle melted sugar free dark chocolate and chopped peanuts. Enjoy immediately or refrigerate for at least 1 hour for a fresher pudding. Store up to 4 days in the fridge in an airtight container. Sweetener: any liquid sweetener works in this recipe. I recommend sugar free liquid sweetener (see details here) but if you are not on a low carb/keto diet replace by same amount of regular maple syrup or brown rice syrup.